February 10, 2017 - Bob Costas, the 26-time Emmy Award winning broadcaster with NBC, has decided to step down as prime-time host of the Olympics. 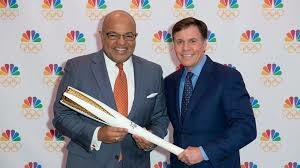 The ASA Advisory Board Member, who has served as the prime-time host of a record 11 Olympic games dating back to 1992, will pass the torch to Mike Tirico, the ASA Lifetime Member who joined the Peacock network in July of 2016 after 25 years at ESPN, starting the the 2018 Pyeongchang Winter Games. Costas, a four-time winner of the ASA's "Sportscaster of the Year" Award gave a ringing endorsement to his successor Tirico, who was the first recipient of the Bob Costas scholarship from Syracuse University. "He’s a very hard worker," Costas said. "He’s a stickler for preparation. He has a broad view of the world beyond just the sport that’s in front of him. He can ad lib, he can react spontaneously to situations which often come up in an Olympics... Mike has all of the tools in that tool kit necessary to do a good job." The 64-year-old Costas said he is not retiring but "transitioning." "I’ll do more baseball for the MLB Network, and maybe if something else comes along that interests me, there will be more time on my calendar to pursue that as well," Costas said.